Professional Education International (PEI) benefits from a close association with the not-for-profit International Engineering Consortium (IEC). Together, they bring enormous credibility and industry service recognition to the Forum: PEI has developed educational conferences in the information and communications technology space on a global basis since its founding in 1974; and IEC, founded in 1944, has provided an important connection between the academic community and industry and serves as a catalyst in bringing leading academics and global business leaders together through quality continuing education, research and publishing and eLearning programs. The Broadband World Forum, (BBWF or the Forum) is the leading conference and technology exhibition in the information and communications technology (ICT) industry. The conference and exhibition registers nearly 6,000 broadband industry professionals who are courted by a broad spectrum of loyal sponsors including large ICT exhibitors and service providers. Informa Telecoms & Media (www.informatm.com) is the leading provider of business intelligence and strategic services to the global telecoms and media markets. 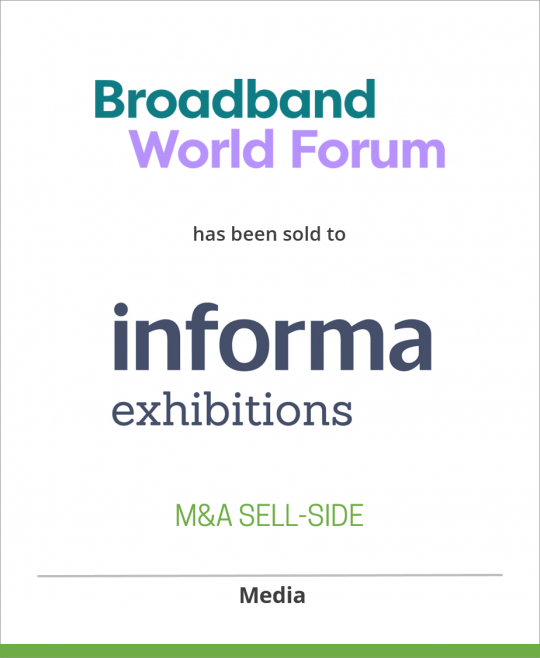 Informa Telecoms & Media also produces 120 events each year around the world and owns the Com World events series, the IPTV World Forum event series, the LTE event series and the Broadband Global Summit, held annually in Dubai. DeSilva+Phillips, Mediabankers™, is a New York-based investment bank that advises dealmakers in every area of the media, information and related technology markets. DeSilva+Phillips provides M&A advisory and corporate restructuring services and private placements of debt and equity, and has completed more than 200 transactions since 1996. Its broker-dealer affiliate, DeSilva+Phillips Corporate Finance LLC, is a member of FINRA and SIPC. DeSilva+Phillips will be holding its 8th annual Dealmakers Summit in New York on February 4, 2009.